MerryVille, USA is a fresh and quirky character based half-hour comedy forged with great reverence for the golden era of television history. Sometimes you'll laugh at Mayor Mallory's pratfalls, shake your head at the antics of eccentric town folk, or take a moment and reconnect with a favorite song. 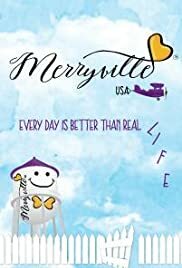 The characters of MerryVille, USA are like family, balancing life's magical moments with dashes of practical perseverance. Each episode celebrates the extraordinary spirit of Merryville, USA.